Total-Zymes PLUS is a full strength combination of digestive enzymes as well as systemic enzymes with Pro-Biotics and Pre-Biotics in a tasty chewable tablet. Total-Zymes PLUS will help combat digestive problems, while enhancing a beneficial bacterial balance. 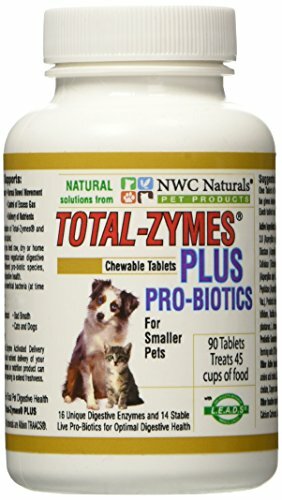 Total-Zymes PLUS is recommended for related issues such as loose stool, skin and coat, sensitive stomach, hairballs, low energy, and even bad breath. Total-Zymes PLUS will help you achieve for your pet Total Digestive Health by improving digestion and absorption of your pet's diet, no matter what you feed them. Total-Zymes PLUS is formulated with 14 vegetarian enzymes and 11 species of Pro-Biotics plus Pre-Biotics. Each tablet supplies 250 million CFUs of those 11 different species of live Pro-Biotics. Total-Biotics is designed for daily use to aid digestion and support a normal immune response. It can also be used in larger amounts to replace the normal pro-biotic balance in times of excess stress. Many things can destroy the intestinal bacteria balance: Stress, poor diet, pollutants, environmental changes and prescription drugs. Overuse of antibiotics also destroys the beneficial bateria as well as bad bacteria. These inbalances or shortcomings can contribute to a host of problems like vomiting, loose stool, poor nutrient absorption, dull coat, low energy and more.Pets with large amount of beneficial bacteria are better equipped to fight the growth of unhealthy organisms. So, if pets are to maintain a healthy body, they need large quantities of friendly bacteria. 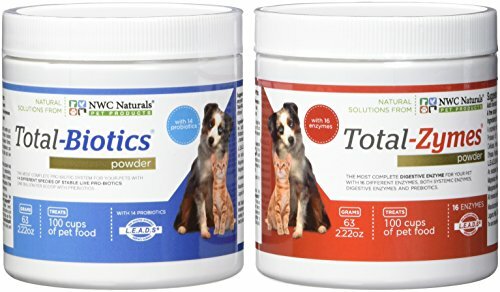 Total-Biotics supplies just the right amount of eleven different species of Pro-Biotics matched to how much food your pets eat.Total-Biotics gives you a unique advantage not available from anyone else. Total-Biotics utilizes L.E.A.D.S which stands for "Live Enzyme Activated Delivery". 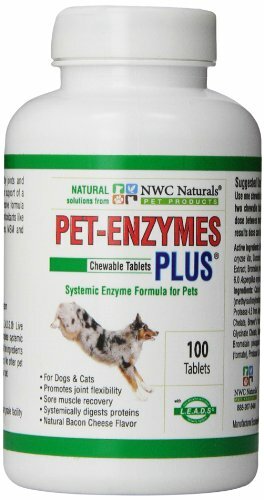 This special enzyme delivery system first used in human nutrition is now available for your pet. It ensures nutrient delivery on a cellular level. Total-Biotics uses only human grade pro-biotics, enzymes and patented amino acid chelated minerals. 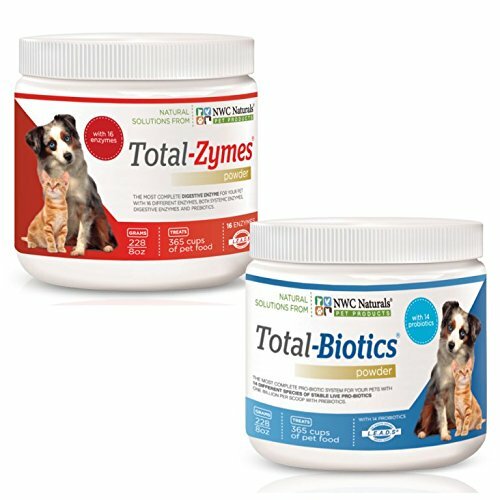 For superior result use the companion digestive aid Total-Zymes along with Total-Biotics and give your pet every advantage for a long and healthy life. Total-Biotics is designed for daily use to aid digestion and support a normal immune response. It can also be used in larger amounts to replace the normal pro-biotic balance in times of excess stress. Many things can destroy the intestinal bacterial balance: Stress, poor diet, pollutants, environmental changes and prescription drugs. Over use of antibiotics also destroys the beneficial bacteria as well as bad bacteria. These imbalances or shortcomings can contribute to a host of problems like vomiting, loose stool, poor nutrient absorption, dull coat, low energy and more. Ingredients: A proprietary blend of Pure L. acidophilus DDS-1, B. bifidum, B. infantis, B. longum, L. casei, L. helveticus, L. plantarum, L. rhamnosus, L. salivarius, L. lactis, S. thermophilus, FOS Fructo-Oligosaccharides (a pre-biotic). L.E.A.D.S. Live Enzyme Activated Delivery System - an exclusive proprietary delivery system of Calcium Amino Acid Chelate, Magnesium Amino Acid Chelate, Amylase, Cellulase, Lipase, Magnesium Glycyl Glutamine. Other Ingredients: Maltodextrin, red cabbage, and beet root. Total-Zymes powder digestive enzyme is a high performance broad-spectrum digestive enzyme formula. Total-Zymes is the most complete pet digestive enzyme product in the world, utilizing 14 high performance plant based enzymes and L.E.A.D.S. Live Enzyme Activated Delivery System. L.E.A.D.S. insures complete digestion and assimilation of all your pets food at a cellular level. Ingredients: A proprietary enzyme blend of Amylase, Protease 4.5, Lipase AN, Malt diastase, Pectinase, Protease 3.0. Bromelain, Cellulase, Hemicellulase, Beta-glucanase, Protease 6.0, Alpha-galactosidase, Phytase, Peptidase. Total weight of proprietary enzyme blend 128 mg. per serving. L.E.A.D.S. Live Enzyme Activated Delivery System - An exclusive proprietary delivery system of Calcium (as Calcium Chelazome), beet (root), Magnesium (as Magnesium Chelazome), Zinc (as Zinc Chelazome), Copper (as Copper Chelazome), Manganese (as Manganese Chelazome, Chromium (as Chromium Chelavite) Other Ingredients: Maltodextrin and Silicon Dioxide. 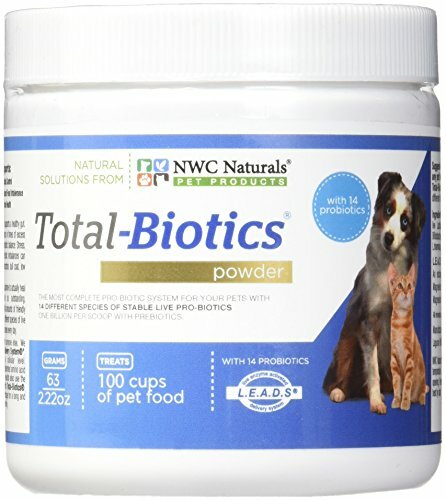 "NEW SIZE” Total-Biotics probiotic powder for pets: Treats 100 cups of pet food. 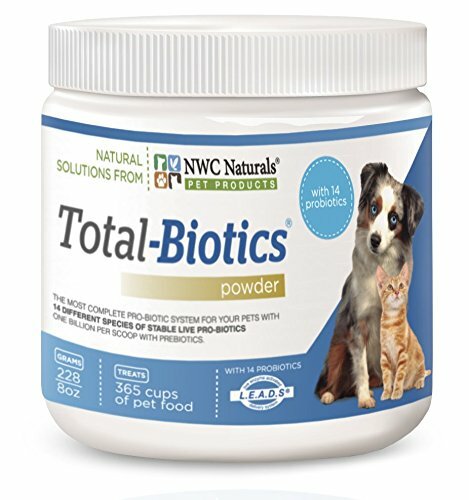 Probiotics and Enzymes together make a digestive machine for your pet. Total-Digestion Twin PackTM includes Total-Zymes New and Improved now with 16 Digestive Enzyme Formula a high performance broad-spectrum digestive enzyme formula. Total-Zymes is the most complete pet digestive enzyme product in the world, utilizing 16 high performance plant based enzymes and L.E.A.D.S. Live Enzyme Activated Delivery System. L.E.A.D.S. insures complete digestion and assimilation of all your pets' food at a cellular level. Total-Biotics is specially formulated with an astounding 11 species of stabilized pro-biotics; To insure that you get one half billion CFUs in each scoop we actually make the product with double that amount, one full billion per scoop. That way if you do not refrigerate Total-Biotics it will still maintain the one half billion CFUs guaranteed per scoop at expiration. 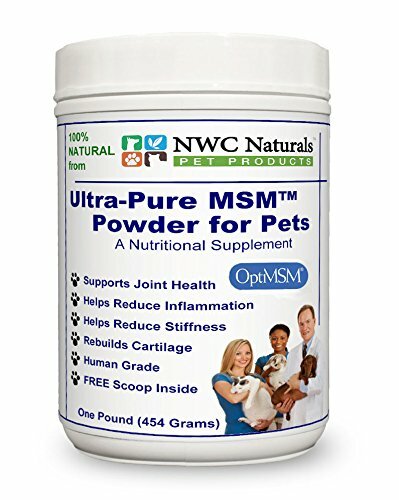 With this great combo pack your pet will reach his optimal health potential. The Total-Digestion Twin PackTM will help combat digestive problems, while enhancing a beneficial bacterial balance. Each jar will treat 100 cups of pet food. For all pets dogs and cats, Horses, etc. Total-Zymes PLUS is formulated with 16 vegetarian enzymes and 14 species of Pro-Biotics plus Pre-Biotics. Each small tablet supplies 800 million CFUs of those 14 different species of live Pro-Biotics. Total-Zymes PLUS is a full-strength combination of digestive enzymes as well as systemic enzymes with Pro-Biotics and Pre-Biotics in a tasty chewable tablet. Total-Zymes PLUS Supports: Good Digestion, A Strong Immune System, Healthy Skin, Smaller Stools, Shiny Healthy Coat, Healthy Energy Levels, Normal Bowel Movements, Normal Gas, and Delivery of Nutrients. 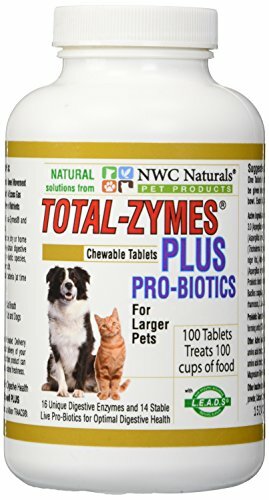 Total-Zymes PLUS will help your pet achieve total digestive health by supporting digestion and absorption of your dog or cat’s diet, no matter what you feed them. Total-Zymes PLUS is formulated with 16 vegetarian enzymes and 14 species of Pro-Biotics plus Pre-Biotics. Each large tablet supplies 1.6 billion CFUs of those 14 different species of live Pro-Biotics. Total-Zymes PLUS is a full-strength combination of digestive enzymes as well as systemic enzymes with Pro-Biotics and Pre-Biotics in a tasty chewable tablet. 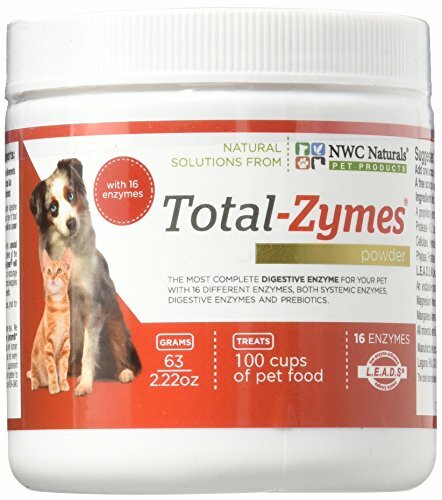 Total-Zymes PLUS Supports: Good Digestion, A Strong Immune System, Healthy Skin, Smaller Stools, Shiny Healthy Coat, Healthy Energy Levels, Normal Bowel Movements, Normal Gas, and Delivery of Nutrients. 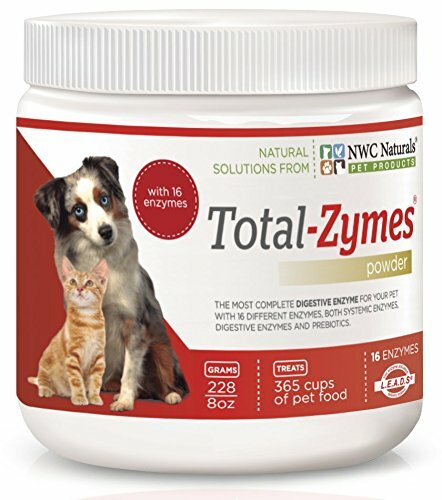 Total-Zymes PLUS will help your pet achieve total digestive health by supporting digestion and absorption of your dog or cat’s diet, no matter what you feed them. Total-Zymes powder digestive enzyme is a high performance broad-spectrum digestive enzyme formula. Total-Zymes is the most complete pet digestive enzyme product in the world, utilizing 14 high performance plant based enzymes and L.E.A.D.S. Live Enzyme Activated Delivery System. L.E.A.D.S. insures complete digestion and assimilation of all your pets food at a cellular level.